Foreword The PfP Consortium of Defence Academies and Security Studies Institutes finds its roots in a proposal by US Secretary of Defence Cohen at the meeting of the Ministers of Defence of the Euro-Atlantic Partnership Council on 12 June 1998. The Consortium aims primarily at strengthening the institutional co-operation between the 44 Euro-Atlantic Partner Countries. In this way, a higher level of professionalism and efficiency can be reached in the fields of training and education of both soldiers and civil servants. Within the framework of the "Washington Summit" in April 1999, the PfP Education and Training Program was welcomed by the governments of NATO and EAPC countries. It is based upon three initiatives, namely the "PfP-Consortium of Defence Academies and Security Studies Institutes", the "PfP Simulation Network" and the "Co-operative Network of PfP Training Centres". Their main efforts centre on joint civilian and military training and education on the national security-political and strategic levels of planning with an aim of strengthening multinationality. In this network between professionals, scientists and experts, substantial exchange of information can take place on various levels. One part of this network, the Working Group "Crisis Management in Southeast Europe", is headed by the Institute for International Peace Support of the Austrian National Defence Academy (IIF/LVAk). As Head of the Institute, I would like to stress the enormous security-political relevance of the work of this Working Group: Austria understands her role within the Working Group as providing a firm basis for dialogue on matters that have been a pivot of European politics during the last decade. 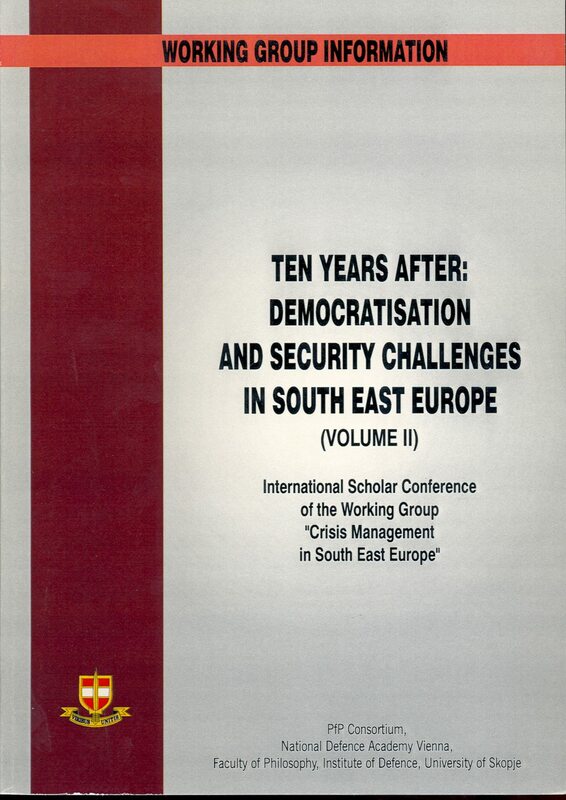 The unique character of the Consortium Working Group on Southeast Europe finds its aim in bringing together military and civilian research institutions and academies concerned with security politics from the region. Through the improved access to information, academies and institutions will be able to improve the efficiency of their training. Security-political institutions are being offered the chance of channelling the results of their research directly into the educational system. The results of the Conference in Ohrid should be a part of the information provided by the Consortium to improve efficiency. In accordance with this basic concept the Working Group aims at furthering the unique academic dialogue that has been created between its participants at the Workshop in Reichenau in May 2000 and the Conference in Ohrid in October 2000 with a perspective of improving the coherence within the Euro-Atlantic strategic community. Finally I want to thank all participants of the Ohrid Conference for their efforts in taking part in the presentations and discussions that have been both informative for all interested in this issues and helpful for the co-operative relations of the countries from the Southeast European region. Special thanks should go to Prof. Biljana Vankovska who did a tremendous work as the organiser of this event. Col Gustav E. Gustenau Chairman of the Working Group "Crisis Management SEE (South East Europe)"